France has a very large Muslim community, which is often abused by right wing politicians to create a climate of detestable xenophobia. 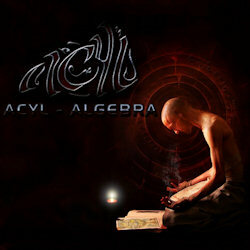 Therefore I was quite amazed at coming across Acyl, a French metal band consisting of people with an Algerian background. Their band name means “genuine” in Arabic, showing at once that they are not hiding their roots. After a self-released EP in 2010, they are now back with their first longplayer titled Algebra on a record label. The Front National and their despicable supporters will probably not be amused by the way how Acyl combine thrash metal with traditional Arabic, Berber and Maghreb folklore. In a time where most metal bands are content to reproduce a sound that has been done many times before, Acyl are definitely trying out new grounds. One might think of Sepultura, had they been from Northern Africa instead of South America, or also Orphaned Land from Israel, although Acyl are much heavier than them. Although the foundation of their music is highly muscled thrash metal, there are also a lot of progressive metal elements, and of course the omnipresent ethnic influences which are highlighted by the use of traditional instruments like the oud, mandola and many more. Another strength of the band are the excellent backing choirs that have an undeniable flair of spiritual incantations. Add to this a truly spectacular production which never fails to merge the different styles into a seamless whole, and you will ask yourself why this band isn’t yet on their way to heavy metal superstardom. I will not pick any special song, because the album as a whole sounds like one amazing sonic journey. Some tracks (Al Kiama, Babyl, Creater) have been subdivided into chapters, displaying the band’s intention to tell a story with their music. Acyl’s thrash and progressive metal both seem influenced by the glorious late Eighties, but the contemporary production helps to give it a fuller sound, and the traditional elements are never just for ornamental purposes, but truly are an integral part of the music. I am not a religious or even spiritual person, but even I can appreciate great art when I come across it. Every metal fan who wants to discover something truly intriguing and original should take this lesson in Algebra!